By Kori ~ September 7th, 2011. Chris Camarda made his first wines in the basement of his motherâ€™s house on Queen Anne Hill in Seattle. After spending 20 years in the restaurant industry, Chris had developed a good palate and decided to try his hand at winemaking. 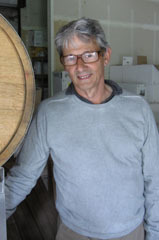 He founded Andrew Will Winery in 1989 and named it for his son Will and nephew Andrew. At first, the winery was located in an industrial space in Seattle. Chris knew the basics of winemaking, he knew a few winemakers whom he called upon for guidance, and he visited California to learn even more about the industry. In 1994, Chris and his wife Annie moved to Vashon Island, a short ferry ride from Seattle. On five acres of property, they built their home and the Andrew Will Winery facilities. Sadly, Annie Camarda lost her battle with breast cancer in 2005. In the early days, Andrew Will specialized in single varietal wines. Even though he received high praise for his wines, especially his Merlot, Chris ultimately decided that he could express more with blends and transitioned to producing single-vineyard blends in 2000. Today, Andrew Will sources fruit primarily from three vineyards: Two Blondes Vineyard, their estate vineyard in the Yakima Valley; Champoux Vineyard in the Horse Heaven Hills, in which they are a part owner along with Paul and Judy Champoux and three other wineries, Woodward Canyon, Powers, and Quilceda Creek; and Ciel du Cheval Vineyard on Red Mountain. On a recent visit to Vashon Island, we toured the winery, visited with Chris, and tasted through the current releases of his primary â€œwhite labelâ€ single-vineyard blends. Andrew Will also produces â€œblack labelâ€ wines, which are typically varietally-labeled and offered at a lower price point. Chris makes a few other wines as well, including an â€œAnnie Camardaâ€ label in memory of his late wife. During our visit, Chris commented that he believes that the wine culture in the United States is changing. He is happy to see more and more people drinking wine and has even noticed more wine drinking on television. After all, wine is a beverage to be enjoyed, preferably with food and in the company of friends. Of the current Andrew Will releases we tasted, my favorite is the 2008 Sorella. Sorella means â€œsisterâ€ in Italian, and this wine honors the memory of Chrisâ€™s sister who passed away in the mid-1990â€™s. Sorella is a Cabernet Sauvignon-based blend from Champoux Vineyard. Andrew Will Winery currently produces about 5,000 cases per year, which is exactly the size Chris Camarda wants his winery to be. As he did when he first started the winery, Chris still views winemaking as an artisanal endeavor. Chris was recognized as the Honorary Vintner for 2011 during the recent Auction of Washington Wines for his contributions to the Washington wine industry. 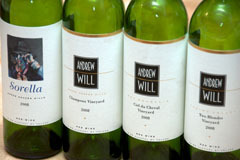 Andrew Will wines are sold though their mailing list and select restaurants and retail shops. Andrew Will Winery is not open to the public but hosts an annual party each fall for their mailing list members. 2008 Andrew Will Sorella (Champoux Vineyard, Horse Heaven Hills, Washington): 80% Cabernet Sauvignon, 14% Cabernet Franc, and 6% Merlot. Deep, dark red. Gorgeous nose with black fruit, pencil lead, and floral aromas. More black fruit, floral notes, and a hint of leather come through on the palate. Medium to full-bodied with crisp acidity, and medium to high, velvety tannins. Well-balanced with a long, smooth finish. 2008 Andrew Will Champoux Vineyard (Champoux Vineyard, Horse Heaven Hills, Washington): 46% Cabernet Sauvignon, 26% Merlot, 23% Cabernet Franc, and 5% Petit Verdot. Deep, purplish red in color. Nice nose with smoked meat, black fruit, and leather aromas. Black cherry, black currant, leather, earth, game, and a hint of cocoa come through on the palate. Full-bodied with good acidity, and medium to high, velvety tannins. Well-balanced with a long finish. 2008 Andrew Will Ciel du Cheval Vineyard (Ciel du Cheval Vineyard, Red Mountain, Washington): 36% Merlot, 32% Cabernet Sauvignon, and 32% Cabernet Franc. Deep, ruby red. Aromatic with plum, pencil lead, licorice, and herbal notes on the nose. Black cherry, plum, and leather on the palate. Medium to full-bodied with crisp acidity and smooth tannins. Well-balanced with a long, elegant finish. 2008 Andrew Will Two Blondes Vineyard (Two Blondes Vineyard, Yakima Valley, Washington): 42% Merlot, 30% Cabernet Sauvignon, 19% Cabernet Franc, and 9% Malbec. Deep, ruby red. Beautiful nose with smoked meat, game, and black fruit aromas. More smoked meat, black cherry, and plum come through on the palate. Medium to full-bodied with crisp acidity and smooth tannins. Well-balanced with a long, elegant finish. With all the praise Ciel wines receive now, a quality rating of 4, don’t you think 2 bangs for the buck is harsh. Still trying to nail down your QPR. So how do I find the similiar wines from Ciel that have a higher QPR? Your QPR would say that there are many, right? What 2008 Ciel red wine should I be looking for in the store? How do I see the other wines it is compared too? So much info seems to be missing. QPRs are not vineyard specific; they are calculated based on all wines of the same varietal/type with the same quality rating in our database.